It would be fair to say that in the first round of matches against the big guns of the league that the Shipyard gave a good account of themselves in the majority of these fixtures. However, second time around the Shippy are struggling to lay a glove on these teams and that was none more so in evidence than when they travelled to Newtown Park to face Bo’ness United on Saturday. There was barely 20 seconds on the clock when the recalled Macaulay Jarrett was picking the ball out of his net. Hardly the start that was needed with United having the strong wind behind them. There were Shipyard debuts for recent signings Scott Hynd and Benn Hutchison and the Shipyard were further boosted by the news that Robbie Crawford had signed an extended contract. That good news was countered by the fact that Dean Anderson, Reece Brown and Sam Glancy were all unavailable. Shippy were under the pump straight from kick-off as Bo’ness scored in their first attack. Jarrett initially did well as he blocked Allan McKenzie’s effort but the big keeper then found himself stranded out of position and McKenzie was able to fire home from around 12 yards. Although Bo’ness had plenty of possession, they did not create too many chances, however, it was again poor defending that brought about their second goal. A cross towards the back post had the Bo’ness players queuing up to score and it was McKenzie who grabbed his second as his looping header beat Jarrett. The Shippy keeper did well to tip a Devon Jacob’s free-kick over the bar that was swung in from wide on the left and McKenzie went close to his hat-trick on the stroke of half-time as the Shipyard hung on. 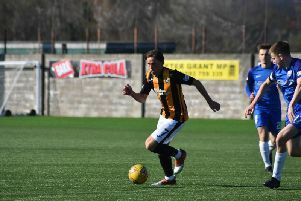 Bo’ness coped better playing into the strong wind and McKenzie got his third goal in the 57th minute with another looping header that left Jarrett helpless. Four minutes later Rab Kinnaird conceded a penalty and Brian Morgan confidently tucked away the spot kick. Substitute Ryan Stevenson added a fifth in the 71st minute before Andy Watt scored a consolation for the Shipyard with five minutes remaining as he produced a fine finish, lofting the ball over Andrew Murphy from outside the box. The sixth and final goal for Bo’ness in the 88th minute was an absolute shocker as far as the visitors were concerned. A scuffed corner was unbelievably allowed to trundle through the six-yard box where Marty Wright, not believing his luck, was able to knock the ball in from close range. Next up for Shipyard is a home fixture against Dunipace this Saturday. Kick-off 2.30 p.m.
Bo’ness United: A. Murphy, D. Jacobs, I. Syme, R. Campbell, J. Macdonald, M. Gemmell, B. Morgan (C. Comrie), C. Donnelly, N. Prentice (F. Keast), M. Wright, A. McKenzie (R. Stevenson). Unused Subs: W. Snowdon, M. McMullan, A. Marshall. Burntisland Shipyard: M. Jarrett, R. O’Donnell, R. Kinnaird (C. Simpson), R. Lennie, S. Strang, R. Bernard, R. Crawford, Jon. Galloway, S. Hynd, B. Hutchison, Jor. Galloway (A. Watt). Unused Subs: R. Adamson, C. McAulay, P. Bell.